(#173) Dr. Eric Goodman joins the show today to talk about optimizing movement patterns, so you can build a solid foundation for strength and overall health. Eric has spent years studying human physiology and movement. He has trained world-class athletes for better performance and has helped heal people of all ages and occupations from lifelong debilitating pain. As the creator of Foundation Training, Eric combines his experience as a strength coach, personal trainer and Chiropractor to create a simple strengthening program that facilitates the body’s natural healing ability and quickly improve degenerative movement patterns. His new book - True to Form: How to Use Foundation Training for Sustained Pain Relief and Everyday Fitness - will show you how to transform ordinary physical actions into active and mindful movements that help to eliminate pain, boost energy, and strengthen the body. By harnessing the body’s natural movement patterns, you can be fit, healthy, and pain-free for good. 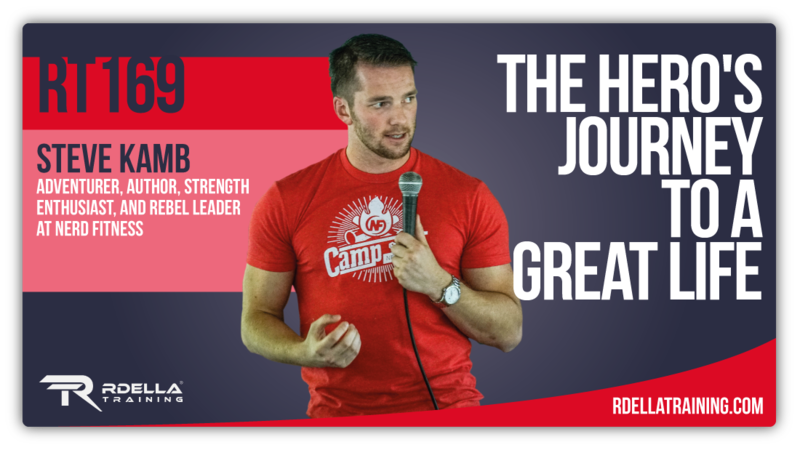 (#172) Dr. Zach Long, Founder of The Barbell Physio, is this week's guest on the podcast. He joins the show to talk about strength and performance as it relates to his approach as a physical therapist. 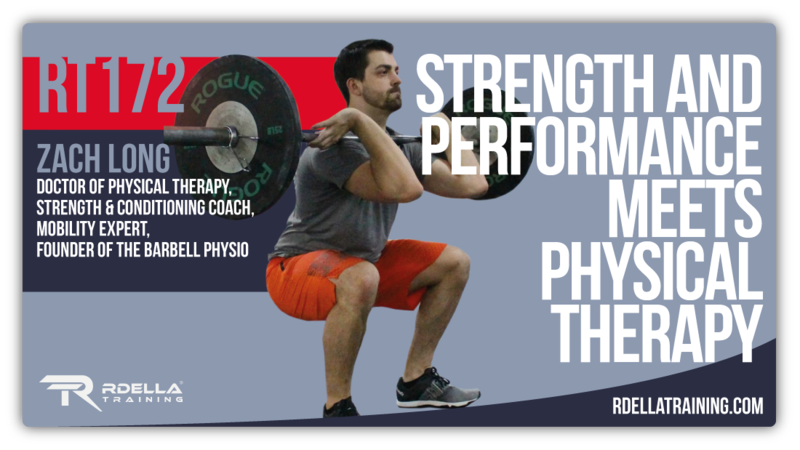 Zach is a Doctor of physical therapy, strength and conditioning coach, mobility expert, and Founder of The Barbell Physio. He specializes in improving athletic performance and injury rehabilitation of athletes of all skill levels. His expertise is sought out by high-level athletes in Olympic weightlifting, CrossFit, professional bodybuilding, the NFL, and elite runners and swimmers. In this episode, Zach teaches you how to break down movement and identify limitations to achieve maximal results. 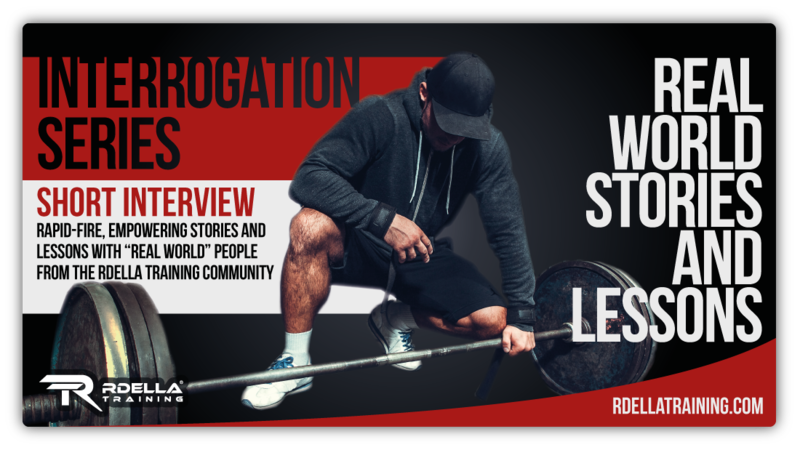 (Interrogation Series #1) This is the first interview of the Interrogation Series on The Rdella Training Podcast. The Interrogation Series features "real world" stories and lessons from amazing people of the Rdella Training community. This is a GREAT interview to kick things off as Ekaterina "Kat" Tabakova shares her inspiring story and "lifestyle ninja" approach to training. 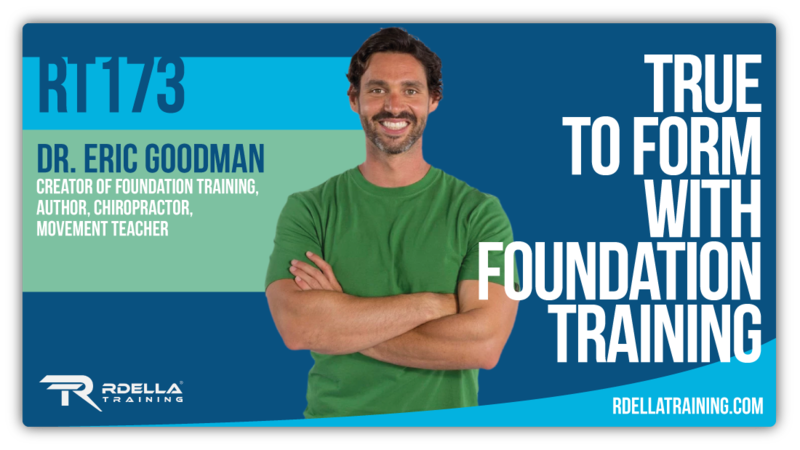 This short, rapid-fire interview is content-rich with awesome resources and takeaways for every fitness enthusiast or coach - including an incredible resource to profile your approach to training (you have to hear about this one). (#171) Greg Nuckols, Founder of Strengtheory, joins me on the podcast this week to talk all about squatting - and so much more. Greg is a strength coach, world-class drug free powerlifter, fitness writer, and creator of Strengtheory. 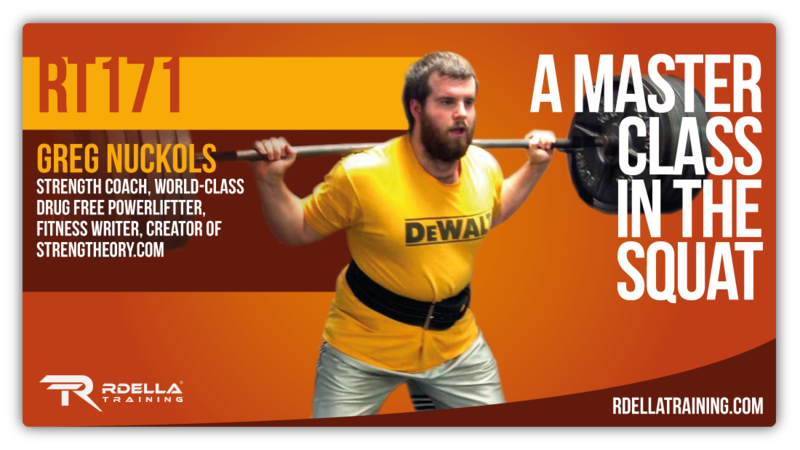 His passion is synthesizing scientific research and in-the-trenches experience to stay at the forefront of the strength game, and to become the best coach and athlete possible. With best lifts including a 755 lb squat, a 475 lb bench press, and a 725 lb deadlift, Greg has become one of the strongest drug-free athletes in the world. During this interview, Greg and I drill down on some of the most frequently asked questions people have when it comes to the squat. You'll learn key insights about spine extension, bracing techniques, common mistakes, and most importantly, how to experiment with your training so you can figure out what works best for you. If that wasn’t enough, Greg also shares phenomenal resources that can help your training right now. 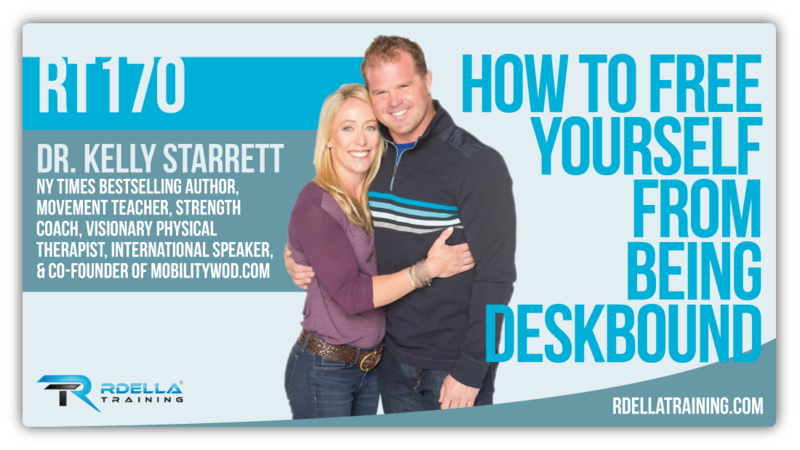 (#170) Dr. Kelly Starrett returns this week as a 4-time guest on the podcast to talk about a critical topic for enhancing your health and living a better life. Kelly Starrett is a movement teacher, strength coach, visionary physical therapist, international speaker, and co-founder of MobilityWOD.com, which has transformed how athletes think about human movement and athletic performance. His first book, Becoming A Supple Leopard, is a New York Times and Wall Street Journal bestseller and was one of the 100 Most Notable Books in 2013 on Amazon. His most recent book (co-written with his amazing wife Juliet and Glen Cordoza) – Deskbound: Standing Up to a Sitting World – unveils a detailed battle plan for surviving our chair-centric society. This book provides creative solutions for reducing the amount of time you spend on your backside, as well as providing strategies for transforming your desk into a dynamic, active workstation that can improve your life. (#169) Steve Kamb, author of Level Up Your Life and the Founder of Nerd Fitness, joins the podcast this week. For the past 5 years, Steve Kamb has transformed himself from wannabe daydreamer into a real life superhero and actually turned his life into a gigantic video game: flying stunt planes in New Zealand, gambling in a tuxedo at the Casino de Monte-Carlo, and even finding Nemo on the Great Barrier Reef. Steve’s book – Level Up Your Life – teaches you exactly how to use your favorite video games, books, and movies as inspiration for adventure rather than an escape from the grind of everyday life. Steve has helped hundreds of thousands of everyday people through his popular website, NerdFitness.com, to lose weight, get stronger, and live better. During our discussion, Steve shares his inspiring journey and the steps he took to build a life worth talking about. In this interview, you’ll learn how to shift your mindset and prioritize your time so you can accomplish anything you set your mind to. (#168) Shawn Stevenson returns to the podcast this week for one of THE MOST AMAZING interviews on the show to date! I’m extremely pumped and excited to have him back on the show for a second round. If you missed our first interview, definitely go back and check out episode 146 for more context around Shawn and his backstory. 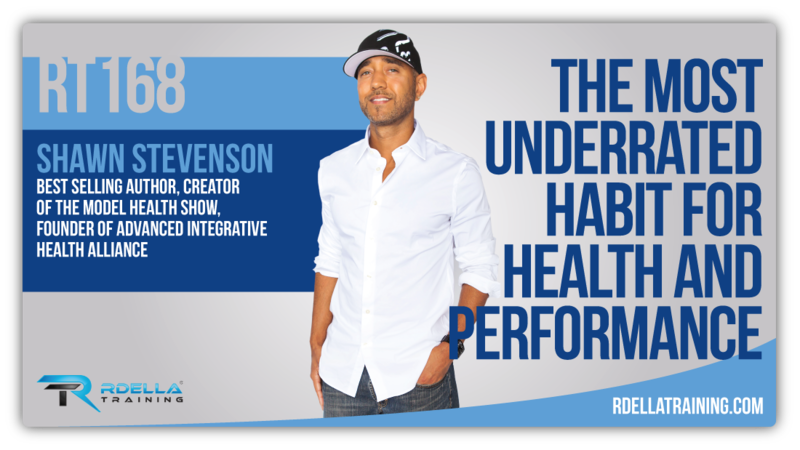 Shawn is a best selling author, creator of The Model Health Show, and Founder of Advanced Integrative Health Alliance. His book – Sleep Smarter – is the ultimate guide to maximizing your sleep and health. It’s a comprehensive resource about creating smarter sleep strategies so you can improve your mind, body, and performance, plus practical solutions to help you get the best sleep ever! 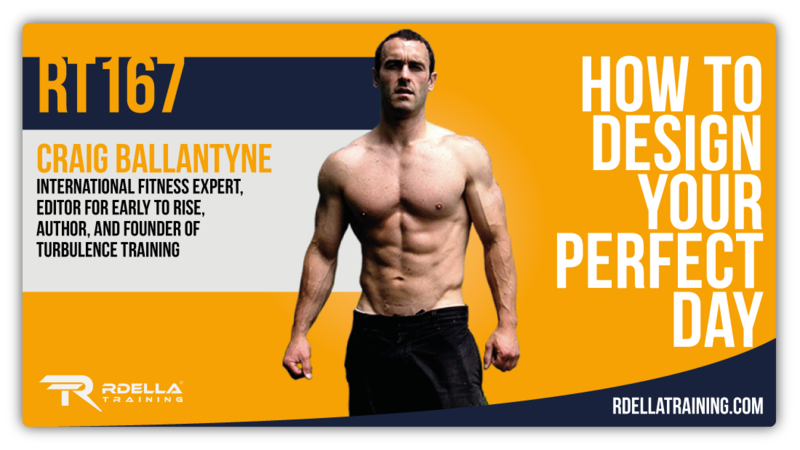 (#167) Craig Ballantyne is a HUGE success in the fitness industry and beyond. This week I’m really excited to share this interview with Craig who shares incredible value during this episode. I can't wait for you to dive into this one! Craig Ballantyne is the Editor of the world-renowned success website, Early to Rise since 2011. He’s also an international fitness expert, author of Turbulence Training, a contributing author to Men’s Health magazine, and a member of the Training Advisory Board for Maximum Fitness and Oxygen magazines. Craig is the creator of – The Perfect Day Formula – which is a complete step-by-step blueprint that anyone can use to achieve more freedom in less time and start living the perfect life. During this interview, Craig and I discuss some of the key aspects of his program, including productivity hacks, identifying what matters most, the 5 pillars to success, goal setting, and so much more. He also teaches you the importance of creating personal commandments, which will ultimately allow you to have more freedom in your life to do the things you’ve always dreamed of doing.